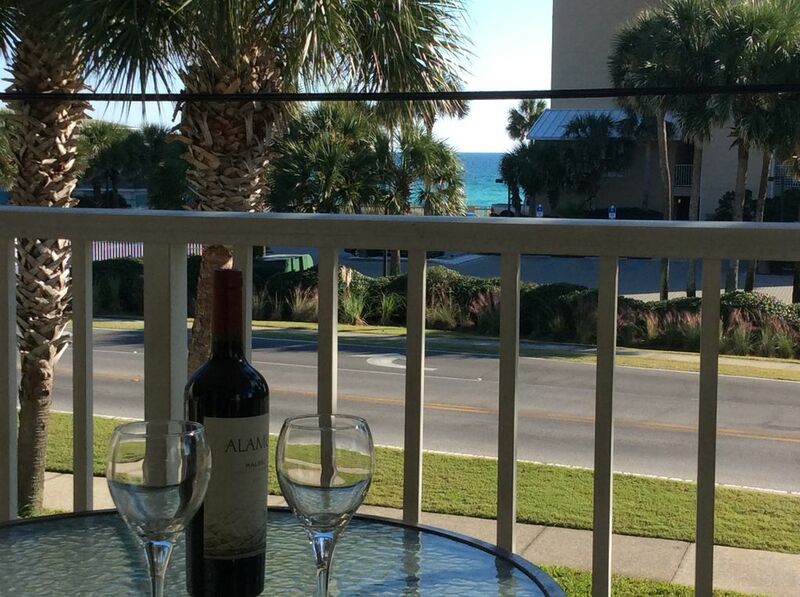 Bright corner unit located in charming, upscale Crystal Beach. Within walking distance of Destin Commons mall, many restaurants and entertainment. Enjoy the privacy of your second floor balcony with a beautiful view of the beach and the pool. Step next door to the Crystal Beach Coffee Shop for a snack or cook your own meals in your fully equipped kitchen. The kids will love the white sand beach across the street. Big Kahuna Water Park is minutes away. Mom will love the many shops and outlet mall nearby. Dad will enjoy the sports opportunities available. All available for less than the cost of a hotel. Perfect location right across the street from the beach. Condo was perfect for our family. Unfortunately we had to leave early due to the arrival of Hurricane Michael. Thanks to owner Ken who kept us up to date on the weather and for a great condo! Julie thanks for the note. I am delighted you enjoyed your time in Destin and sorry your vacation was cut short. However with the hurricane approaching the safety for your family was our first concern. Property was clean, convenient, and had everything we needed. We loved the balcony, the walk right across the road to the beach, and the pool. The condo was also within very short driving distance of stores, restaurants and attractions. We would definitely like to return, thank you Ken! Thanks for your comments, Destin is a great location for a family vacation. I am delighted that you and your family enjoyed your time at the beach. Hope to see you return again! Great beeches. Great Condo. Great vacation. This condo was perfect for our family of 4. Very clean and great beech access. Would definitely stay there again. Delighted you had a good vacation in Destin, hope you join us again! Great condo! Has everything you need and is in close proximity to stores and restaurants. A short walk across the street and your at the beach, and we loved that we were right beside the pool. Ken was an absolute pleasure to work with. The whole family had a great time and we can't wait to return! . My family and I really enjoyed our stay here. Its an amazing condo! Ken was great!! Very accommodating. I was blown away with our experience here. We look forward to returning next year! Destin is a great vacation destination, our goal is to provide our guest with a comfortable condo which has easy access to the beach, pool, shopping or dinning. We look forward to their return Destin. Our family of 5 stayed here on our way back from Disney. We all enjoyed the clean accommodations and especially the close 5 minute walk to the beach. The owner provides boogie boards and chairs for visitors to use while at the beach which was convenient for us. There are also some DVDs and books for anyone wanting to take a break from the sun. Thanks John for the review, we are delighted that you and the family enjoyed your time in Destin.